The international success of carrot cake has surely paved the way for experimentation with root vegetables in other cake recipes. Put the butter and chocolate in a heatproof bowl. Set the oven at 180°C/Gas Mark 4 and put the bowl in it for a few minutes until the chocolate and butter start to melt. Stir, then put back in to the oven for a few more minutes to melt completely. Of course, you could melt them together in the traditional way, over a pan of hot water, but it is a shame not to exploit the warming oven. Whisk the eggs and sugar together in a large bowl until combined then beat in the melted chocolate and butter until smooth. Combine the salt with the flour, sift them over the chocolate mixture, then gently fold in with a large metal spoon. 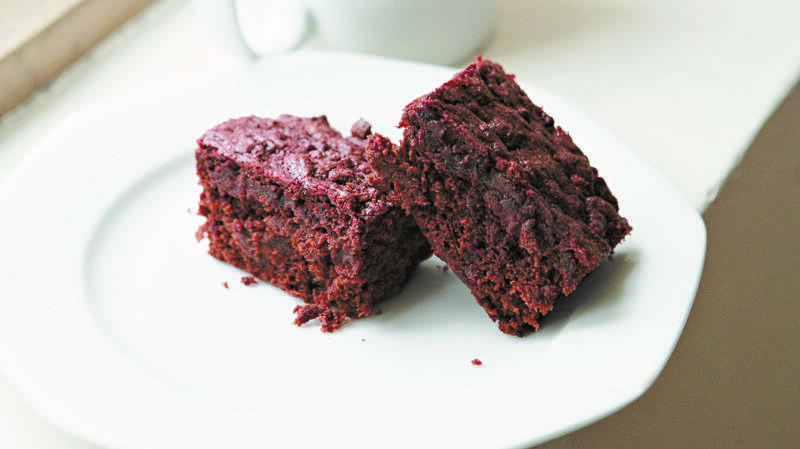 Fold in the grated beetroot – be careful not to over-mix or it will make the brownies tough. Pour the mixture into the prepared tin and smooth the top with a spatula. Bake for 20 – 25 minutes; when the brownies are done, a knife or skewer inserted in the centre should come out with a few moist crumbs clinging to it. Don't be tempted to overcook them or they will be dry. Remove the tin from the oven and leave on a wire rack to cool before cutting in to squares.